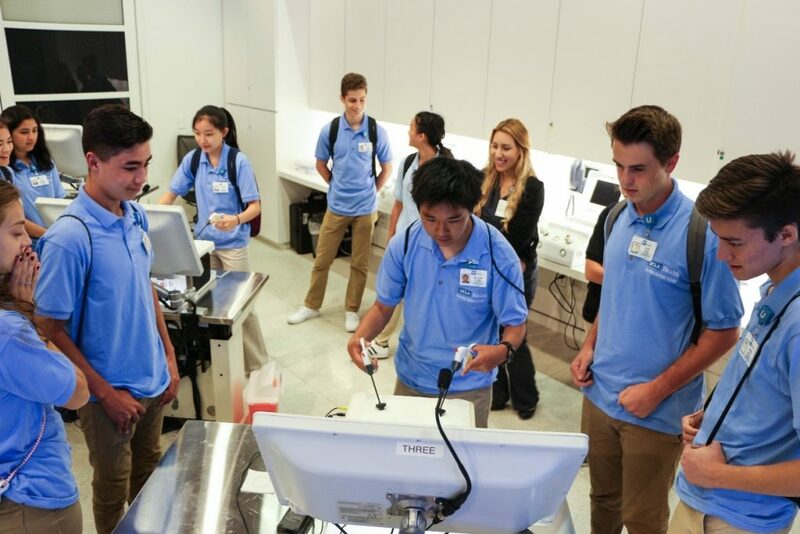 Students participating in the UCLA Health Pre-Med Summer Scholars program practice their robotic surgery skills at UCLA's Center for Advanced Surgical and Interventional Technology. What did you do over summer vacation? One group of teens will share their stories of watching an autopsy, practicing robotic surgery and checking out a hyperbaric chamber. The experience was part of a special week-long UCLA Health Pre-Med Summer Scholars program held in late June and designed to give high school students a chance to explore careers in medicine. Scott Davidson, 16, has known since the 8th grade that he wanted to become a doctor. “That’s when I really started thinking about what I want to do and how I can benefit people and change this world,” said the Moorpark High School junior, who discovered the program while searching online for ways to increase his knowledge of medical careers. The UCLA Health Volunteer Services department created summer scholars last year in response to many inquiries from the community about opportunities geared towards high school students that offered a specialized, in-depth look into healthcare careers. This year, about 150 well-qualified students applied for one of the 24 coveted spots. Each day-long session was filled with visits to various UCLA Health departments like biomedical engineering, pathology, brain mapping, hyperbaric medicine and hearing presentations from professionals in oral surgery, pathology, cytology, physical therapy, cardiology, internal medicine, oncology and more. Clarissa Cabil, 17, a senior at Notre Dame High School in Sherman Oaks, always thought she might become a pediatrician, but the program opened her eyes to other specialties that really peaked her interest. The scholars also spent time personally talking with physicians and medical students. They asked questions about the process of getting into medical school, what medical school is really like and about the hard work of being a practicing physician. “Everything here really confirmed my choice of what I want to do in the future,” said Davidson, who wants to specialize in oncology. To learn more, visit the UCLA Health Pre-Med Summer Scholars program.